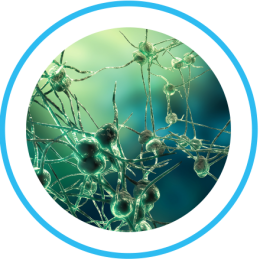 Many neurodevelopmental conditions can often exist together, but each can be treated in different ways. The picture below illustrates how the conditions overlap. Please use the drop down menu to view other conditions. 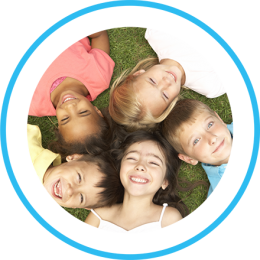 What Is Sensory Integration Disorder ? 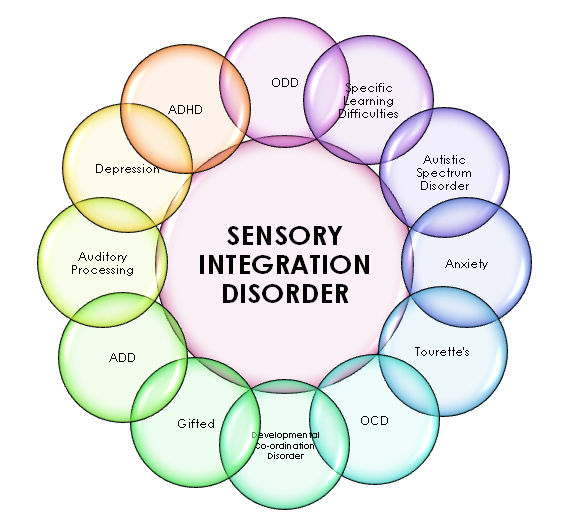 Sensory Integration Disorder (SID) or, as it is often called, Sensory Processing Disorder (SPD), is a neurological disorder that results from the brain’s inability to integrate certain information received from the body’s sensory systems. 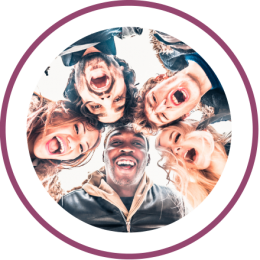 The individual reacts in an extreme way to normal things that he or she experiences. It varies between individuals in both characteristics and intensity: children may be born hypersensitive (over-responsive to stimuli), or hyposensitive (under-responsive to stimuli) – which may result in avoidance of an activity. Individuals can have trouble in one sensory modality, a few, or all of them. Some people are so mildly affected that the disorder is barely noticeable, while others are so impaired they have trouble with daily functioning. What Are The Symptoms Of SID ? Tactile: the sense of touch. Sensitive to clothing textures and clothes labels. Dislikes hair brushed or washed. Reacts badly to being touched unexpectedly. Unusually sensitive to being too hot or cold. Visual: the sense of sight. Overwhelmed in a visually ‘busy’ enviroment. Focuses on little details in a picture and misses the whole. Loses his/her place frequently when copying from the blackboard. Auditory: the listening sense. Low tolerance of noise generally, says that noise ‘hurts ears’ or gives him/her a headache. Or, seems not to register sound. Fails to respond to hearing name called. Oral: the sense of taste & texture. Fussy or picky eater with determined food preferences and limited range. May lick, taste or chew on inedible objects. Dislikes toothpaste and brushing teeth. Olfactory: the sense of smell. Disturbed by cooking, bathroom or perfume smells. Or, may not notice unpleasant, noxious odours or be able to distinguish smells/fragrance. Vestibular: the sense of movement. Avoids playground apparatus and equipment. Fearful of heights. Or, may crave movement experience, especially fast or spinning. Thrill seeker. Proprioception: the sense of body position. Difficulty understanding where their body is in relation to other objects and may appear clumsy and bump into things. Misjudges the weight of an object. In addition, there are many general behaviours and traits that are associated with SID, eg. agitation, frustration, aggression, low self esteem, difficulty unwinding or sleeping and appearing out-of-sync with self or others and the environment. The neurological disorganization resulting in SID occurs in three different ways: the brain does not receive messages due to a disconnection in the neuron cells; sensory messages are received inconsistently; or sensory messages are received consistently, but do not connect properly with other sensory messages, – leading to the inefficient motor, language or emotional outputs. How Is SID Diagnosed ? SID is usually recognized in early childhood or adolescence but may be seen throughout a lifespan. An evaluation may be conducted by a qualified occupational or physical therapist. This normally consists of both standardized testing and structured observations of responses. Information from parents and other professionals is also carefully analysed by the therapist. What Is The Treatment For SID ? The aim is to motivate and stimulate changes in the way the system processes sensory information, but not so much as to make him/her shut down or go into sensory overload. A ‘sensory diet’ may also be implemented – a schedule of daily activities designed to develop the needs of the individua’ls nervous system.